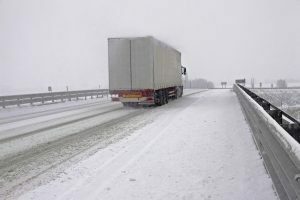 With winter well underway and a polar vortex striking much of the country, having winter driving safety tips on hand is critical to trucking for any duration. While you might be aware of some of the winter driving basics, the current weather extremes mean that new precautions must be taken. We’ve put together four critical tips for winter driving to help ensure you and your cargo both arrive safely. No matter how good or experienced you are as a trucker you will inevitably get stuck. With the threats of winter weather and low visibility, this can mean that you are in danger of being missed by other drivers and rescue teams. Before you head out, make sure that you have plenty of additional layers, blankets, food, and water along with your trucking essentials stashed in your truck. With temperatures in the midwest recently reaching record lows, having a spare source of power to create heat can be essential. If you become stranded there are a few particular precautions you must take. First, never walk down the highway or away from your truck. If the weather is bad you may become disoriented and lose your way back; other drivers will not be able to see you, and you will be putting yourself at higher risk. Instead, stay inside or as close to your truck as possible. You may need to leave your vehicle on occasion to ensure that the exhaust pipe is clear to prevent carbon monoxide poisoning. One of the best ways to gauge how the roads are is to pay attention to the spray coming off of other vehicles. When the spray is visible, it means that the roads are wet but are not entirely freezing. If the spray has stopped the risk of black ice and freezing is exceptionally high. You will also want to keep an eye on any build-up of ice on your antennas or mirrors to help gauge the temperatures and road conditions. When severe weather strikes your speed should always reduce. In the event of wet conditions you should expect to reduce speed by ⅓, and in snow, your speed should go down to ½ what it would typically be. Not only will this allow for better control and stopping, but you’ll be more likely to reduce your chances of getting stuck. Last but not least, always use your best judgment of when to stop. Sometimes it’s best to wait out the storm somewhere you know you will be safe and warm. Work with your fleet manager in advance to have a severe weather plan so that you can stop for bad weather without worry. This entry was posted on Friday, February 1st, 2019	at 4:39 pm	and is filed under Trucking Basics	. You can follow any responses to this entry through the RSS 2.0	feed. Both comments and pings are currently closed.